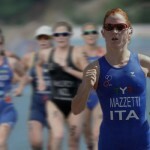 Hamburg, Germany – In the seventh edition of the ITU Triathlon Mixed Relay World Championships, France scored its first World Championship title in a down to the line fight. After Great Britain edged out the team in 2014, this year it was France’s turn to put themselves on the top of the competition. 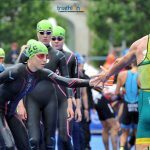 Despite moody and cold weather, thousands of spectators gathered around the city’s town hall to watch what has become one of the most exciting disciplines in the sport, which sees a team member complete a mini triathlon. Vincent Luis (FRA), one of triathlon’s fastest rising stars, led the French team to victory, followed by a brave Australian team, while the British team took bronze. Although the German home team was in the mix until the final minute, all chances of a podium dissipated due to a 10-second penalty. “It was awesome. It is incredible to see how so many Germans are mental about triathlon. It was great to race with their support and also good to put on such an spectacle for them,” stated Bailie at the end of the relay. 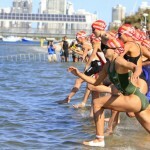 One of the most eagerly awaited competitions of the ITU calendar, the race was was thrilling up until the last minute. Known for its unpredictability, wet conditions and last minute changes in personnel set the stage for a dramatic event which didn’t disappoint. Great Britain, Germany and Australia positioned themselves as leaders on the first leg of the woman-man-woman-man relay, but no guarantee was given to any of them as they couldn’t manage a break big enough to fend off the fast French team. Despite a 17-second deficit after the first leg, France’s Dorian Coninx was key in getting France back up to the top trio. From there it was a fight between the four Federations as the final two athletes prepared to tag off from their teammates. Great Britain’s Non Stanford bossed her way through the swim after the team’s second leg lagged slightly behind. A monster run earned her teammate Mark Buckingham some extra seconds in hopes of securing a gap that would fend off France’s anchor Luis. But Buckingham lost the advantage in the water and was overtaken by World Triathlon Hamburg men’s individual gold medallist Luis as well as Australia’s Ryan Bailie. Back to a four-team breakaway, the men settled together on the two-lap 6.6km bike. Although the foursome came into the final transition together, Bailie and Luis bolted out in front of Germany’s Gregor Buchholz and Great Britain’s Buckingham. In a similar story as Saturday’s individual race, Luis found himself in a dual fight until the finale 200 metres, this time with Bailie instead of four-time World Champion Javier Gomez. And just like on Saturday, Luis found another gear late in the race to pull away from Bailie to secure France’s first-ever Mixed Relay World Championship title leaving silver to Australia. 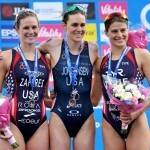 Behind them, the battle for bronze heated when Buchholz tore off in front of Buckingham. But crippled by a ten-second penalty caused by a mistake in transition by Germany’s third athlete Rebecca Robisch, Great Britain stole bronze while Germany settled for fourth.